If I were to describe how this GenCon went for me, I would have to say I was on Cloud-9. I got to meet so many wonderful people. This year was the best convention experience I have ever had. Last year, I attended GenCon 50 and wrote an article as a guide to large conventions. If you haven’t read that go back and read through it first, this will not be the same article. I will be covering some additional topics to expand on it, but I don’t want to repeat that article. If I were to schedule this again, I would move most of my events earlier in the day and more towards the end of the week, giving me time to hang out with people later in the day, with some time to roam the trade hall, which closed at roughly 6pm every day. I also HIGHLY recommend that you find a map of the convention center when you start constructing your schedule. While this year I didn’t mess up nearly as bad as last year, I clearly was not reading the room names because on the first day I had to practically sprint across the convention center to catch my next event. Be wary of this if you have two events back to back. My focus for this convention was less on the educational track as it was last year. Last year, I took a ton of the writing panels for my schedule. The events I took were a combination of learning and meet-ups. I also managed to get myself into a game which was a ton of fun (the Tomb of Neon by Pat and Aram). The rest of my time was roaming the trade hall and talking to panelists. I even met up with the Saving Throw Show, unexpectedly, who we love raiding after our Tales from the Tavern stream. Overall, I learned so much more from speaking with individuals. Meeting up with so many people I have only seen on twitter was an amazing experience. Talking with people and sharing what everyone has found at the con helped flush out anything you might not have had time to catch. My favorite part of the Con however, was meeting up with Chaotic Anarchy and the wonderful group of individuals she managed to gather. Everyone was super nice, funny, and just a joy to be around. It honestly makes me look forward to going next year. One of the strangest experiences I have ever had to date occurred while attending a panel on Diversity in Roleplaying. For reasons that I will not get into, the panelist were unable to make it to the panel and they had announced that the panel was canceled. That clearly was not enough for the audience because we took over the panel ourselves. In a rush of the moment I found myself sitting at the panelists table, discussing diversity in roleplaying games and the media surrounding them. Looking back I was absolutely terrified of the experience and once we got up only then did I realize what I got myself into. It was a topic that I had felt only slightly confident on however I had always believed that because I am a straight, white male no one would want to hear my opinion on the matter. It is in fact the reason I have neglected to write my own article on the topic. Well after this I have literally zero excuse to avoid the topic any longer. So expect to get an article on the topic. Overall, the audience seemed fairly satisfied and we got a bunch of questions, and I realized areas of my own knowledge I had not considered. I was happy with how it turned out and happy that we could supply people with a panel despite outside conflicts. A lot of individuals who head to GenCon end up sharing what they got on social media. Normally I would have, but just after GenCon I was packing up all of my things and getting ready to move, so I lost the location of a majority of the things I managed to get. Digging through a few boxes I managed to find most of the things I purchased in the trade hall. Clearly, at GenCon 50 I completely missed this amazing find. These are some of the nicest brushes I have every come across. Just feeling the brushes made me fall in love with them. Kolinsky Sable brushes are made from the hairs of a weasel that normally people have a hard time keeping in captivity. Not only did I get an amazing set of brushes, I learned some things about brush care that I was unaware of. Like for instance that you shouldn’t use paper towel to clean off your brushes (at least your nice ones!) as it can actually damage your brushes. They were also selling a soap, but I already had more than I would need for some time. I spent about $45 USD on this amazing find by Games and Gears for four of the best brushes. They had one brush that was smaller however it was sold out. Next year, next year. I have a personal rule: I only buy one set of dice for myself when I attend a convention. To many of the dice addicts out there this may sound like blasphemy, but if I didn’t I’d be overwhelmed by dice. Instead, all the dice purchases I make outside of conventions are usually for other people such as giveaways or gifts. This year, I actually didn’t even have to buy myself dice, because the wonderful folks at Tabletop Loot, our sponsor, gave me a set of dice! However, I did end up going to a Chessex booth to get something special for our viewers during Tales from the Tavern. As you might not know we do cheer/donation rewards. At 100 bits/$1 USD a viewer can grant a player a point of inspiration. 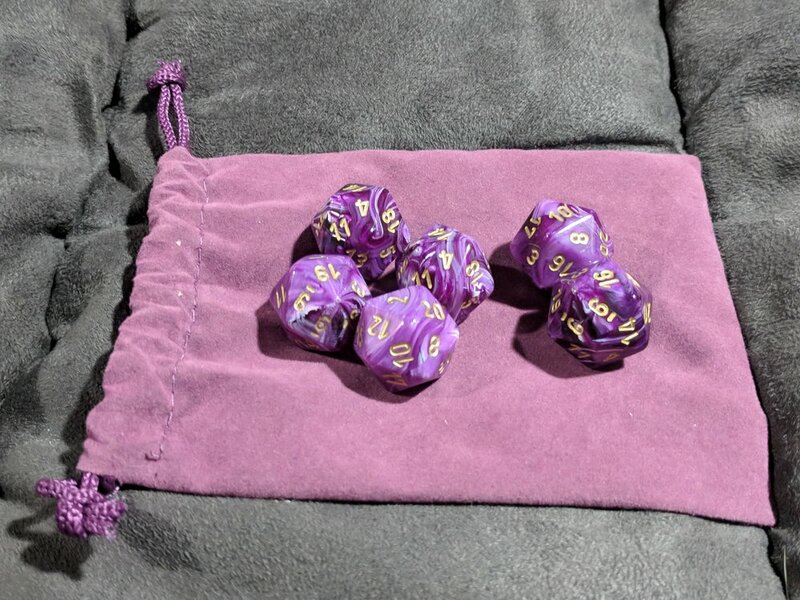 For this I actually pulled open my twitch app and found the closest purple dice I could to give out to players when a viewer donates for this reward. Now we have something physical for everyone that is generous enough to support us! This was possibly the only item that I sought out from knowledge before the convention. By a freak occurrence I got an email from the folks over at Infinite Black. 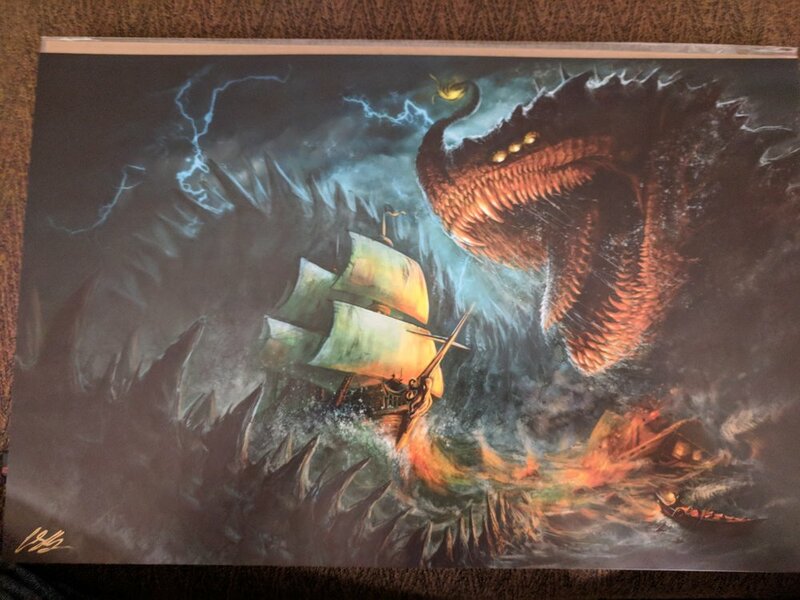 That email contained some of the coolest playmats I’ve seen. Now I don’t play Magic: The Gathering, but I definitely can use a playmat for all the dice I roll during Tales from the Tavern. While I can use a dice tray, its bulky and often gets in my way. I also grabbed one for my significant other because she said she liked one of the designs. These were beautifully made by the artist David LaRocca. I learned a little history about Dungeons and Dragons from the wonderful folks who showed me this. First, there is a thing called Appendix N, the list of materials listed in AD&D Dungeon Master’s Guide (funny enough under Appendix N) that inspired Gary Gygax in his creation of the game. Dungeon Crawl Classics went back and wrote another system using the same materials. While I got the quick start rules (what says is $5 but they gave to me for free!) I am actually disappointed I did not manage to get back around to pick up the full book. While personally, I don’t have much interest in running the game, it has a very interesting take on spell casting and from a game design standpoint is an incredibly interesting read. This was super cool and for several days while walking to panels over in the Lucas Oil stadium the line for this was massive. So on Saturday, or possibly on Sunday, I decided to get in line and get a miniature made of me. I sat down in a chair and a lady took an Xbox Kinect and scanned my head. I then went up to a guy at a table and got to choose the body they would put my head on. The only downside of this was that they said it would take anywhere from 6-8 weeks to get to me, so at the time of writing I still have not received it. But believe me when I do, I’ll be posting it all over social media. The company making it is Minuteman Miniatures. This was a complete impulse buy. In no way did I need it, until I saw it. I dug through my stack of business cards, but I can’t seem to find anything that reminds me of who was selling this wonderful product. The shop keeps voice was hoarse while she took the diligent time to explain to me how to use this wonderful product (that I very much will be using for props). 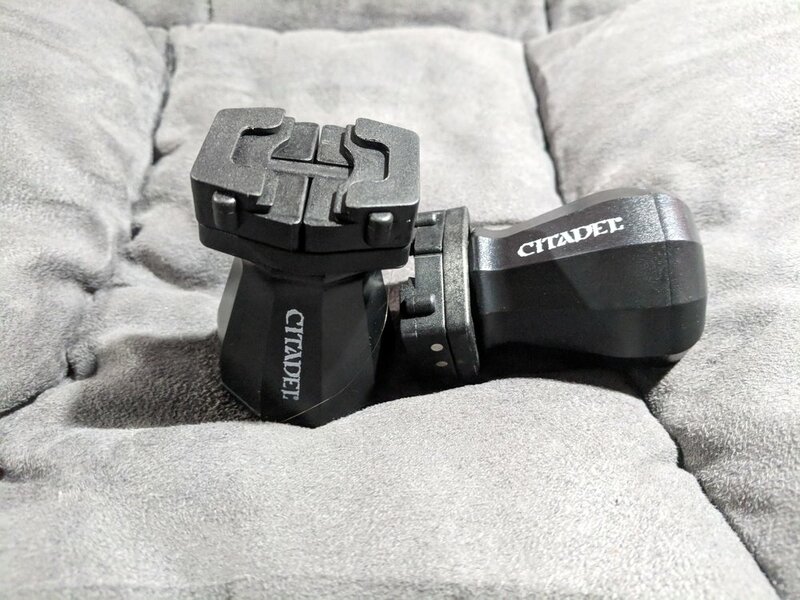 If anyone knows who was selling this product, please leave a comment so that I may give them the credit they deserve for taking their time with me. For a while I have been trying to get my hands on a tool to aid me in holding miniatures while I paint. Having to hold a miniature by its base is actually rather tiring and causes hand cramps. 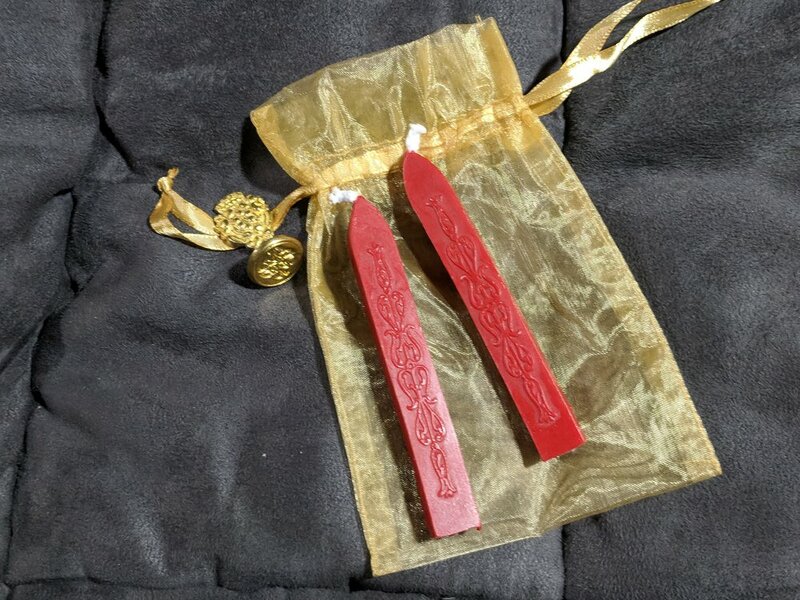 So when I nearly ran past the Games Workshop booth, as I tend to avoid larger companies that I can buy their products online, I was surprised to see their painting handles being sold. At the time they were nearly sold out worldwide and I had not been able to get my hands on them. With them only being $8 USD I decided to grab two. Hopefully it will extend the amount of time I am able to paint without cramping up. Admittedly, I had to keep myself from buying as many prints as I did last year. However, I did purchase two from Crystal Sully who was a wonderful friend during the convention. She has some amazing artwork and I couldn’t help but grab my two favorites. The Kraken Hunter was one that I had not seen finished because she finished it only a mere three days before the convention, the prints were even delivered to her booth (now that’s service!). 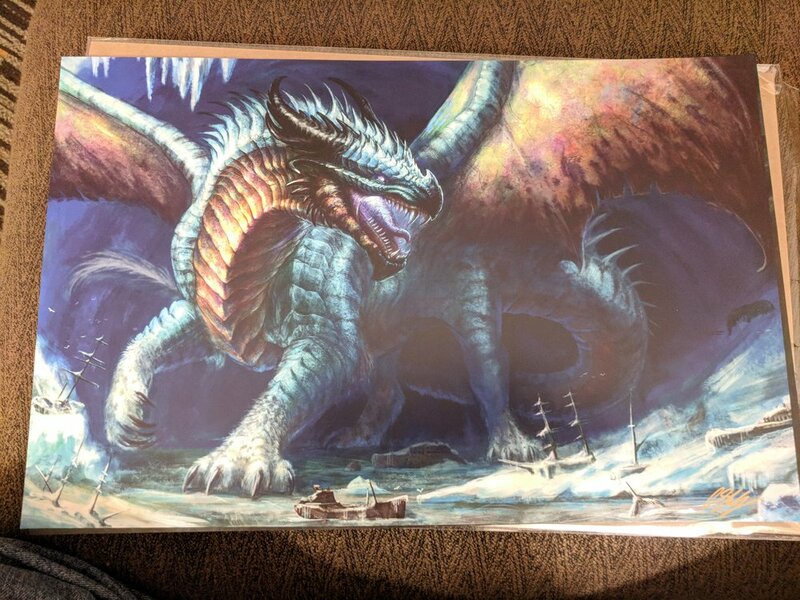 I also bought Jokul the Dread, because I am an absolute sucker for ice dragons in general. They will soon be making it onto the wall of my new office! Overall, I could not be happier with the time I spent at GenCon this year. I sat on my first panel, met wonderful people, got some cool stuff, and played an awesome game! Next year I hope to bring Katie along with me and meet up with more folks from the community. This convention always has something new for me to see and I don’t think I will be missing out in future years.